Adina Pernell is a reiki master, energy worker, crystal healer, massage therapist and student of the esoteric. Music festival season is here. African American Music Month coming up in June, and this month is Jazz Appreciation Month. 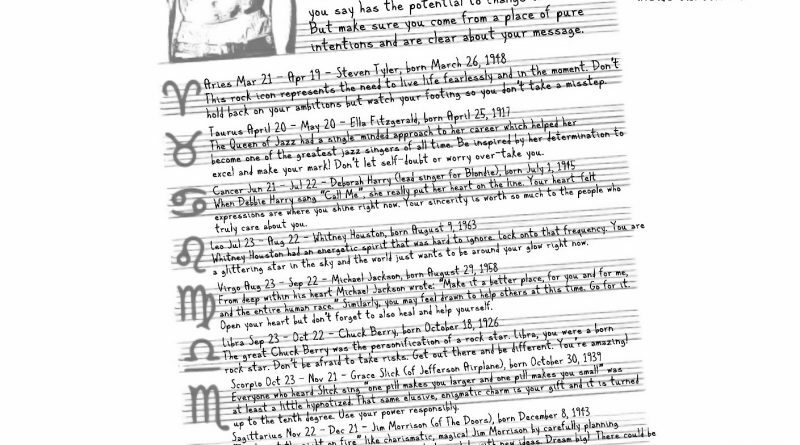 It seems appropriate that this month’s horoscopes channel the energy of some of our favorite musical artists both living and dead as archetypes and representations of the creative space that we each hold inside of ourselves. This 69 year old rock icon represents the need to live your life fearlessly and in the moment. Don’t hold back on your ambitions. And now that you’re done second guessing yourself, accept your true place in the world. Keep your eyes on the prize, but watch your footing so you don’t take a misstep. Whether it is a person, a place or simply a state of being, know that you have all the stuff it takes go get what you want. So move at a slow and steady pace, not rushing ahead and keep getting closer to your goal. Before rock and roll there was jazz. Known as the Queen of Jazz, Ella Fitzgerald’s single-minded approach to her career helped cement her has one of the greatest jazz singers of all time. Be inspired by her determination to excel and make your mark! You may be tempted to wallow in despair about a situation or turn of events, but now is the time to be strong. Don’t let self-doubt or worry over-take you. Whoever is in your inner circle, draw close to them for support. Take a note from pages inked by Tupac’s legendary pen when he wrote “guess change is good for any of us”. You are feeling the need to disturb the status quo and express yourself through writing and other mediums with your usual complex dualism. Your ideas speak to the underdog and downtrodden. They might not be so popular right now. But keep trailblazing, because what you say has the potential to change the world! But a word of caution for this Mercury retrograde season, make sure you come from a place of pure intentions and are clear about your message. When Debbie Harry sang “Call Me”, she really put her heart on the line. Your heart-felt expressions are where you really shine right now. Don’t hold back even though Mercury retrograde is in full force right now. Do contemplate what you say first but don’t keep your feelings all bottled up. You’re not doing yourself or your loved ones any favors by playing along. Your sincerity is worth so much more to the people who truly care about you. Whitney Houston had an energetic spirit that was hard to ignore. And who could resist dancing just a little bit and singing “with somebody who loves me”? Lock onto that frequency. There is something infectious about your energy this month.You are a glittering star in the sky and your aura is so bright that the world just wants to be around your glow right now, especially amid all the rainstorms and with the air of sadness that seems to be hanging around this month as people reorder their lives. When Michael Jackson wrote “Make it a better place, for you and for me, and the entire human race,” in “ Heal The World”, the words were coming from a place deep within his heart. Similarly, you may feel drawn to humanitarian efforts at this time. So go for it. Volunteer in a soup kitchen, or the local SPCA. Open your heart to help others, but don’t forget to also heal and help yourself. Often times it’s possible to do both. The late great Chuck Berry was simply the personification of a rock star. Bold, brash, taking risks, both musically and in his personal life. Libra, you were a born rock star, so don’t be afraid to take risks, even with Mercury opposed. Sometimes, shaking up your life a little can be a good thing, and the road less traveled can be paved with success. So get out there and be different. You’re amazing! Who of us wasn’t just a little bit hypnotized when they heard Slick sing “one pill makes you larger and one pill makes you small,” in her ambiguous hit “White Rabbit”? This is your gift Scorpio — that elusive, enigmatic charm that people find entrancing. That force of nature that makes you, you will be turned up to the tenth degree. Just be sure to use all that power responsibly. Like charismatic, magical frontman of Doors, Jim Morrison, ‘try to set the night on fire”! You can do it this month by carefully planning your next phase as we move further into the shadow of Mercury retrograde. By mid-May you will be ready to explode with all the new ideas and projects you’ve amassed, because you will have already worked out all the details. It could feel like you can spin the world with your fingers or snap them and manifest your dreams like a rabbit out of hat! Dream big! There could be a foreign destination or two in your near future. As Pat Benatar sings, “love is a battlefield”. Have you felt particularly beat up by love at the moment? Maybe it’s because you’re forcing things, or jumping in too quickly. Dial back your intensity for a while and accept everything the way it is right now. It will get better, but for the moment just chill out. Inhale and exhale. There will be plenty of time and opportunities to get back into the fray next month. When Carole King began penning songs that would become some of the most popular tunes in the rock and roll canon, and simultaneously broke into the male-dominated world of hit-making, she took it all in stride and marched to the beat of her own drum. It’s time to do what you do best Aquarius and that is to simply be unapologetically yourself. Don’t really pay too much attention to the world around you because there is a method to your madness and even if no one, not even you, understands it right now, the full scope of your vision will become clearer after the fog of planetary retrogrades clears. The soul of a poet and the heart of a rebel drove Kurt Cobain’s emotional intensity. Be dreamy, and imaginative and you never know what strange and beautiful tapestries you could create. Express all the unexpected sides of yourself in new and inventive ways. Just keep in mind that although you can let out a lot of the rebel inside of you, be wary of being too reckless. There is such a thing as too much.